I hate to go all Alan Moore on this thing, but I really don't see the need for an explanatory paragraph establishing this story. 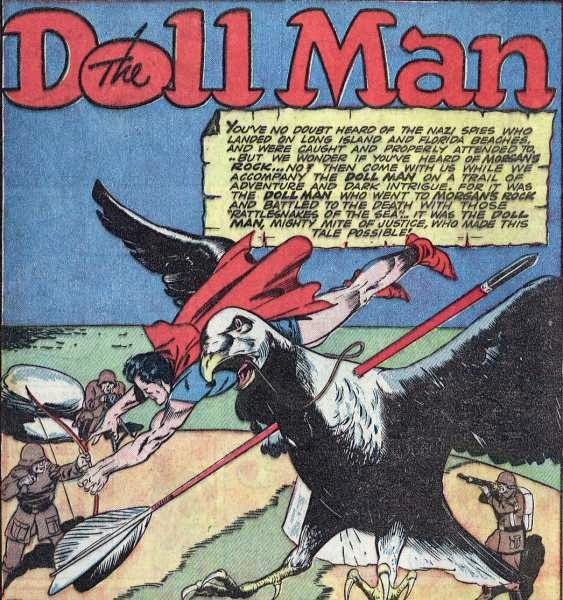 If there's anyone on earth who looks at this image - Nazis attempting to kill Dollman as he rides a pigeon (or perhaps trying to kill a pigeon that Dollman is coincidentally riding), using a bow that they had for some reason - and isn't completely on-board with the rest of the story, what could you possibly write that would turn that opinion around? Seriously, people of 70 years ago, just cut the text and make the bird even bigger. People of the future will thank you for it.